Drummer Billy Kilson's early influences (Weather Report, Tony Williams, Headhunters) are evident on this jazz/funk/fusion project. Joining him are Kenny Davis, Mike Sim, George Colligan. Billy Kilson is one of the world’s elite drummers and his newest CD “POTS & PANS” showcases his talent with a bold and dynamic statement. Billy has many strengths and on this recording his use of dynamics and ability to lay down that mighty groove exceed expectations. He also demonstrates speed, dexterity, and a delicate touch with great listening skills by being truly in tune with the moment. While the recording mix has him clearly front and center, I found it was not a distraction since he doesn’t overplay. In fact, one of this recording’s highlights is that you can hear everything he does, thankfully! The cover art seems to indicate that Billy began playing as many drummers (including myself) by banging on the family pots and pans. While most gave it up, it’s obvious Billy kept banging and now he’s one of the very best drummers on the planet. The BK Groove band is perfectly matched with Billy for this recording. No mistakes here and lot’s of great intuitive contributions. There are some great compositions that are played flawlessly right next to some really tight improvisations. What I especially enjoyed is that no one dominated the sessions and the group plays as one unit throughout the recording. These guys are talented, really “together”, and support each other from beginning to end. Regarding the style of music here, the song titles give you a big clue to the combination of urban and international appeal. The overall feel is Jazz/Funk/Fusion but it also has a much wider appeal. Now, if you can figure out what that means, you’ve got something. I can’t pin down the style to one particular genre and I feel that’s one of the recording’s strong points. Most Cd’s that try to have a little bit of everything usually ended up sounding like a lot of nothing. Not here, and that’s good for us fans, but hard if you’re trying to give the music a name or to put a label on it. There’s just too many ways to enjoy it or narrow down the style and pigeon hole it. Overall, this new recording from Billy Kilson and BK Groove is a joy to listen to casually as well as scrutinize note by note. I would highly recommend it to drummers without hesitation, and to any instrumental music fans that appreciate great playing by talented musicians. I should also add that while I’m a Jazz Rock fan from it’s hey day in the late 60’s and especially early 70’s, Jazz Rockers looking for a typical shred fest will be disappointed, and that’s a good thing. 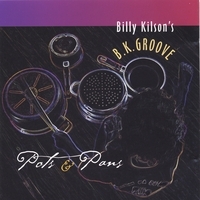 POTS & PANS is a highly inspired recording from one of jazz’s greatest drummers, Billy Kilson. The award-winning drummer who performed with Dave Holland’s various ensembles for the better part of his career, leads his own BK Groove into the limelight with a daring 14-track rendition of the group’s relationships and experiences. Accompanied by bassist Kenny Davis, Michael Sim on saxophone, and George Colligan on keyboards, these seasoned vets of the music scene offer listeners a solid chance to groove to their stellar improvisations, “groovements” and emotions. The first four tracks are brief “Groovements” which set the stage for Kilson’s dynamic set. “Fuyu Hanabi” a reflection of the holiday season in Hokkaido, Japan, features Michael Sim on soprano sax. The influence of Weather Report, the Jaco years clearly comes through during the solos by Sim and Davis as they instinctly play off each other’s expressions. “Guardian Soul,” is a four-minute mallet solo that reflects Kilson’s affinity for African proverbs and a deep connection to his mother while “Indiescission” is probably the best representation of the many influences in BK Groove. This piece is a great jazz/rock fusion piece that demonstrates the versatility of the group and their ability to explode in an array of awesome rock-inspired notes and progressive jazz elements. POTS & PANS is pure, unfiltered and a great form of expression for Kilson’s many influences. Billy Kilson’s BK Groove is a musical melting pot. Their funky jazz fusion is a summation of the vast talents, experiences and influences from each individual band member. Their discographies include some of the most recognizable names in jazz. As sidemen, they have toured all over the world, recorded with some of the top musicians, and received numerous accolades, rave reviews, nominations and awards (including one Grammy). So when they came together and began creating their own sound, it was no surprise that the music was diverse, original and inspired. Billy Kilson, drummer and leader of Billy Kilson’s BK Groove, was exposed to jazz, funk and R&B at an early age. As a child, he was also exposed to a variety of genres through his father’s massive recording collection consisting of music from Count Basie and Duke Ellington to Junior Walker and James Brown, and he also listened to Sly and the Family Stone, Earth Wind and Fire and The Parliament, accompanying them all on drums. After graduating from Berklee School of Music, Kilson toured with Donald Byrd, Ahmad Jamal, Dianne Reeves, Bob James, George Duke and many others. He joined the Dave Holland Quintet and Dave Holland Big Band where he became a Grammy winner for his work with this renowned group before joining Chris Botti’s band. His work with Chris has enabled him to make several television appearances (“Oprah,” “The Today Show” and others) as well as appear on arena tours when Chris opened for Sting and Josh Groban. Bassist Kenny Davis’ career began by listening to great R&B artists such as Earth, Wind & Fire, Brothers Johnson and the Temptations. A self taught musician, he first discovered jazz at Northeastern University. His jazz influences include Ray Brown, Paul Chambers, Ron Carter, Jaco Pastorius and Verdin White. Davis’ touring experience includes appearances with Herbie Hancock, Dianne Reeves, Art Farmer, Abbey Lincoln and Cassandra Wilson. In 1999, Davis was invited by Kevin Eubanks from “The Tonight Show” to join their band and was a regular on “The Tonight Show” for three years before returning to New York to tour, record and teach. Michael Sim, BK Groove’s saxophonist, literally has a world of experience. He has lived in New York, Toronto, Montreal and parts of Europe which gave him the opportunity to work with a variety of artists such as Phil Dwyer, Pat Collins, Barbara Dennerlein, Dennis Chambers, Roy Hargrove and many others. Upon returning to the United States, Sim toured with Michael Franks, Mingus Big Band, and Lee Ritenour. He has made several original recordings as well as worked on other recordings and film soundtracks. While at Berklee College of music, Sim received the Boston Jazz Society award and received a merit award from Berklee. George Colligan, keyboards, has been on the New York jazz scene for over a decade. He is an award-winning composer (Chamber Music America/Doris Duke Foundation grant recipient) and player (Jazzconnect.com Jazz Competition) and has over 80 recording credits as a sideman. A graduate of Peabody Conservatory of Music, he has toured, recorded, and/or performed as a sideman with Cassandra Wilson, Steve Coleman, Ravi Coltrane, Lenny White, Michael Brecker, and Christian McBride, among others. As BK Groove, they come together as seasoned musicians, reading each other like a favorite book, anticipating the next move perfectly, stepping out to solo at the perfect moment and keeping the groove going at all times. The quality of their musicianship is second to none. The uniqueness of their music will incite heads to bob and feet to dance. Like most young drummers, Billy Kilson began his career in his mother’s kitchen with her pots and pans. His love for the drums began to grow as he grew. Pots and pans, twigs and sticks were used to create a beat. Seeing her son’s interest in music, Billy’s mother enrolled him in trumpet lessons and later he switched to trombone. His yearning for the drums continued and finally, for his sixteenth birthday he received his first drum set. Billy went immediately to work to develop his drumming skills. He realized he was working against the clock since most professional musicians began taking lessons on their chosen instrument in grade school. "I practiced as much as 14 hours a day. That was it; there were no short cuts. I had to work around studies and other responsibilities. But all through college and the early years after college, I tried to put in those 14 hours on the drums." Billy learned all different styles of playing. Inspired by funk and R&B, he listened to groups such as Sly and Family Stone, Earth Wind and Fire, Parliament & Funkadelic, Max Roach, Philly Joe Jones, Billy Cobham and played along with the records. "I listened to everything. Since so much of my early playing was self-taught, I think this was the key to my diverse styles. My father loved music and on Saturdays, his favorite thing to do was to listen to music all day long. He had a massive record collection consisting of artists from Count Basie and Duke Ellington to Junior Walker and James Brown." At sixteen, Billy attended the Maryland Gifted and Talented Institute for High School Students. At seventeen he went to the Shenandoah Music Camp and heard one of Stanley Clarke's and Miles Davis’ recordings featuring Tony Williams. "I felt he was the most innovative drummer I had ever heard. I was mesmerized by his playing," recalls Billy. He was overwhelmed with the sound and kept trying to learn this technique, but felt he didn't have enough hands. "I kept saying, 'How does he do that. It's impossible!" Billy learned that Tony Williams' teacher was Alan Dawson who had taught at Berklee. But the greatest musical influence in Billy's life was his mother. "She taught me to have faith, be focused and anything is attainable. She is the one single person who believed in me and encouraged me. I owe any success I have to her." out in the world and perform. Alan told Billy that Walter Davis Jr. was planning a European tour and looking for a drummer. Upon Dawson's recommendation, Billy was invited to audition. He landed the job and he was on his way. After the tour with Davis, word spread and the calls began to come. Donald Byrd, Ahmad Jamal and Dianne Reeves were some of the first artists who hired Billy for their tours. "I was with Dianne for seven years and playing in her band helped introduce me to all of the major festivals both here and in Europe." From this exposure, Billy caught the attention of George Duke, Najee, Freddie Jackson, Bob James and the calls kept coming. Eventually Dave Holland invited Billy to join his quintet. As the drummer for the Dave Holland Quintet, he brought an element of funk to the band, creating a new sound for them and catapulting them into a premiere group in jazz. Critics frequently lauded his performances, particularly his expertise with odd meters. He received a Grammy for his work with Dave Holland and has received several nominations. Billy then joined Chris Botti’s band. Chris had just landed an opening spot for Sting’s tour which enabled Billy to play to a more diverse audience. Chris always allowed Billy the opportunity to stretch musically and he brought his element of funk and odd meters to Chris’ band. Although he has achieved notable success as a sideman in concert and on recordings, Billy’s first love is creating and performing his own music. Influenced by the funk and fusion music of his youth, Billy began to write his own music and plan his first recording, While Ur Sleepin’. Later he assembled some of his peers, Kenny Davis, Mike Sim and George Colligan to form BK Groove. They came together as seasoned musicians, reading each other like a favorite book, anticipating the next move perfectly, stepping out to solo at the perfect moment and keeping the groove going at all times. Their music is diverse, original and inspired. They began performing and developing a new energy of their own which led them back to the studio to record. Like Billy, they all had diverse backgrounds and the project became a summation of their collective musical experiences. Their latest album, Pot’s & Pans is a jazz/funk/fusion project with a special nod to drummers. Billy continues to perform with Chris Botti as well as with his own band, Billy Kilson’s BK Groove. If you are a lover of the drums, you'll love this one. This CD is to jazz music what modern art is to painting. It's full of style and innovation. Each tune grabs you and takes you to a different place.